Map Samples - 2009 Maps of the Month - Maps & Facts Unlimited, Inc. 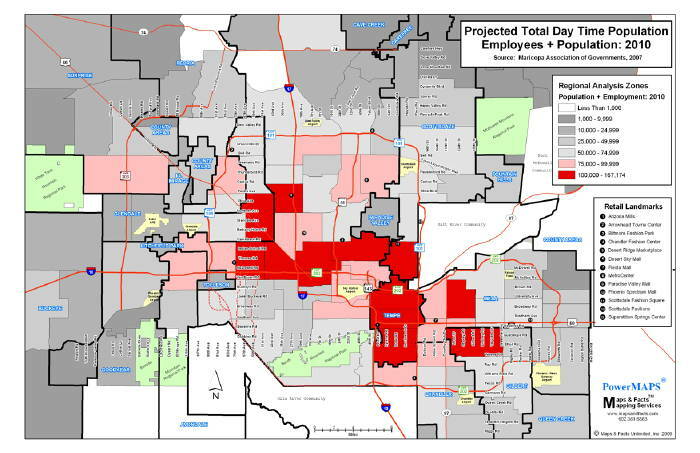 The attached map shows MAG’s projected job growth from 2005 to 2020. On a base of 1,750,00 jobs, the compounded job growth rate is 3% per year. Optimistic, especially as of January 2009? Regardless, the “hot spots” are where the job growth will occur. Hispanic Trade Area "Hot Spots"
We were recently engaged to indentify sites for a Hispanic oriented retail service. The US Census identified the Tracts shown in magenta as the most populous. 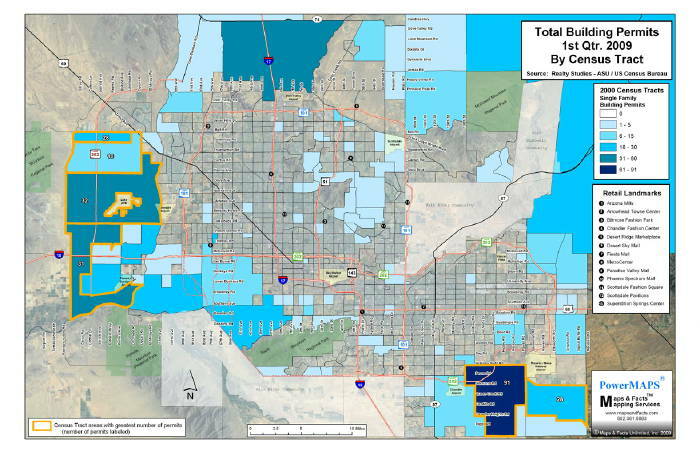 Be aware that Census Tracts are based on total population, not geographical size. 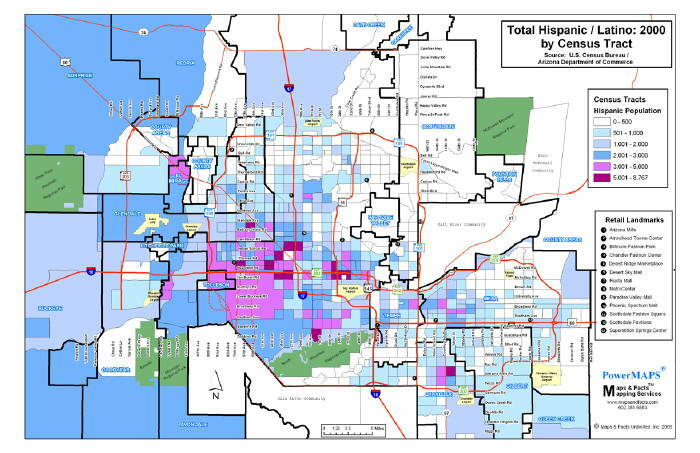 The smaller (1 square mile) Census Tracts in magenta are the true Hispanic “hot spots” based on density. We were recently asked to map the office addresses for several business organizations in order to help select convenient meeting places. The attached map shows where most of the members work. Looks like The Camelback Corridor trumps Central Ave! Maps & Facts™ can map customers, clients, patients, members, sales, etc. by street address or zip code. For marketing, these databases can be “cloned” to identify similar geographic and demographic characteristics. Surprising Characteristics of Lender Owned Listings! 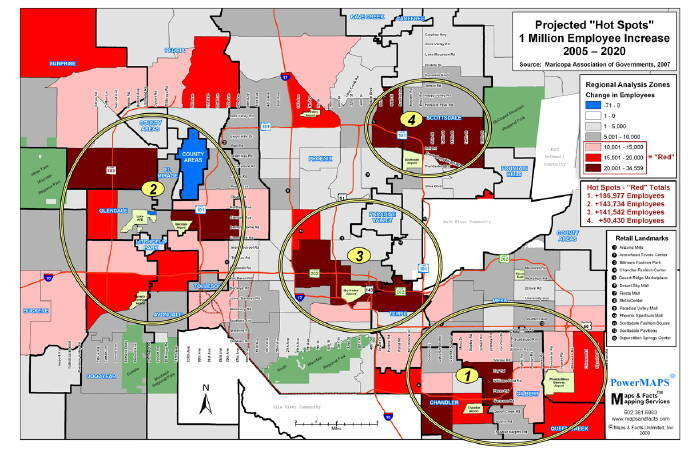 Maps & Facts mapped all 3,282 lender owned, MLS listings as of June 18th by mile square grids expecting to find most listings in the newer “drive till you qualify” subdivisions on the edge of development. 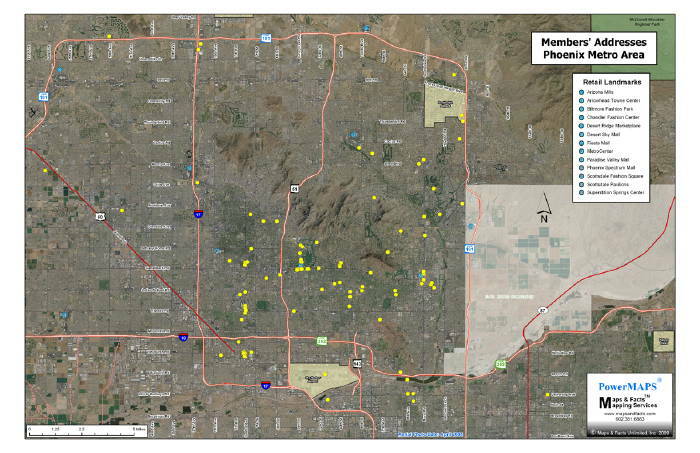 To our surprise, and as the attached map shows, the highest concentrations were in older “West” Phoenix subdivisions. Since many of these houses were last purchased in the early 2000’s or before, hyper inflated sale prices do not explain their high foreclosure rates. Guessing; these foreclosures are a proxy for the economy, i.e. job losses and low net in-migration? When will Apartments Come Back? 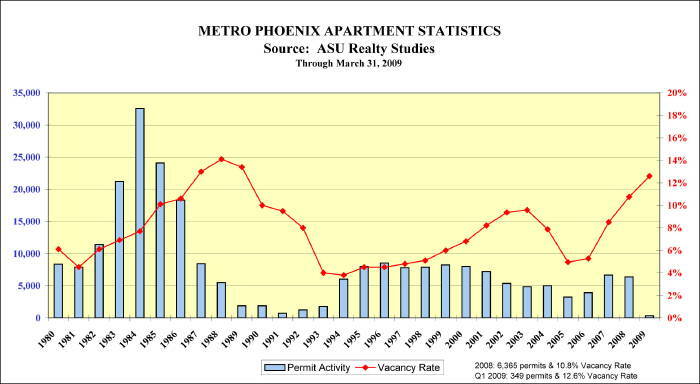 Usually apartment vacancy rates go up when permit activity increases, and, down when permit activity decreases. This time, vacancy rates are going up when permit activity is already low and declining. Will high(er) vacancy rates be the new norm? Map 1 shows change in re-sale prices (traditional). Map 2 shows change in number of (traditional) re-sales. As shown on Map 1, Housing Districts with the smallest price decreases (Dark Blue) were also the Districts with the smallest increase in number of re-sales; as shown on Map 2 (Red + Orange). Stability? As shown on Map 1, Housing Districts with the highest price decreases (Red) were also the Districts with the highest increases in number of re-sales (Dark Blue); as shown on Map 2. Volatility? Elementary Schools Pass AIMS Test with Flying Colors! 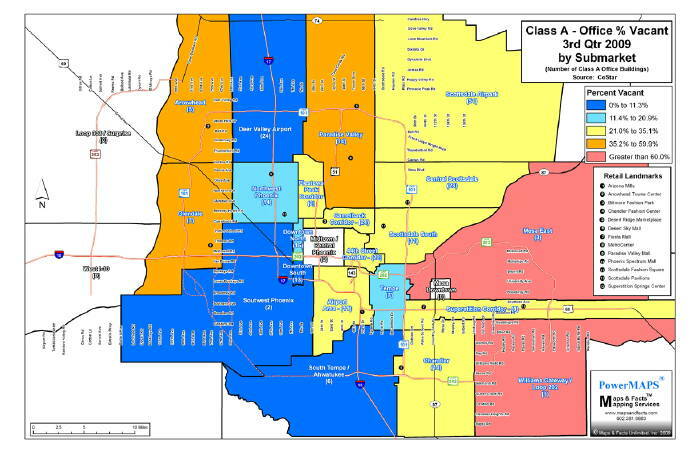 Each year Maps & Facts™ compiles AIMS Test Scores for all Maricopa County Public Schools utilizing color coded GIS maps. As shown below, for 2009 thirty five (35) of the thirty eight (38) districts represented showed improvement. 2008 Blues became 2009 Greens. 2008 Yellows became 2009 Oranges. Congratulations! Where to Invest in Single Family Homes? 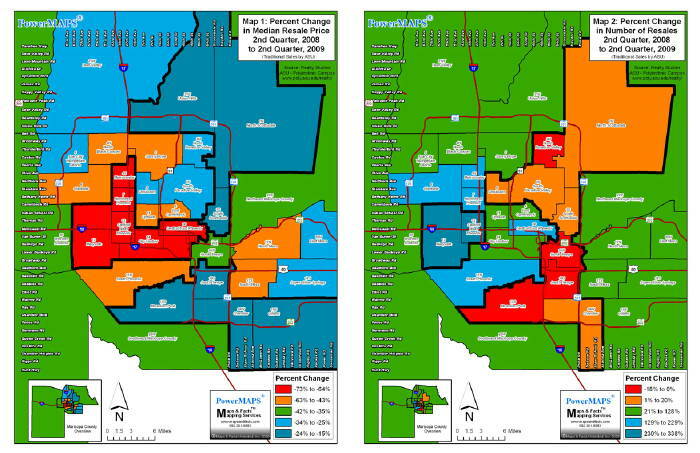 This map shows the change in median re-sale prices from 2nd Quarter 2004 to 2nd Quarter 2009 based on ASU’s Phoenix Metro Housing Study (Traditional Sales). 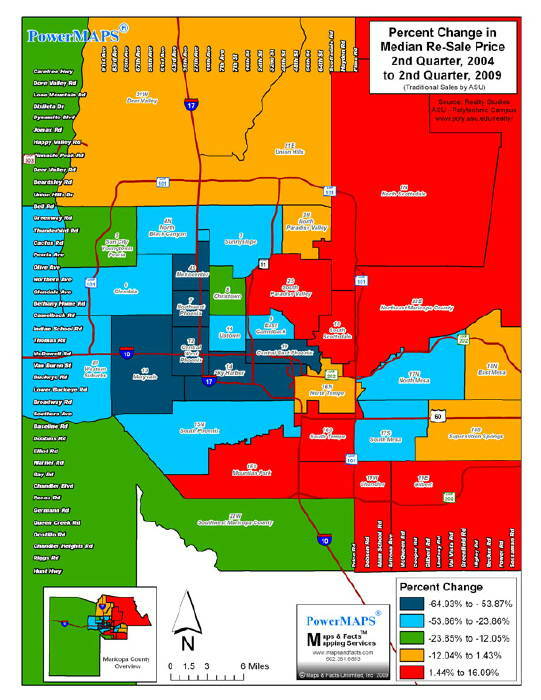 The largest decrease was in Housing District 12, Central West Phoenix ($99,800 to $35,000). Assuming the market will eventually recover, shouldn’t there be more upside in Blue vs. Red? Office Market: Absorption? Absorption? Absorption? Net absorption since 1st Quarter, 2008 has been negative. Absent job growth, vacancy rates may remain in the 25-30% range for many years. It appears, once again, that the 3 most important things in Real Estate are Absorption, Absorption, and Absorption! Foreclosures: What Difference does a Year Make? This month we updated our December 2008 PowerMAP® depicting the total number of Lender Owned Properties and the four most concentrated census tracts. The good news is that the four 2008 census tracts are no longer as concentrated. The bad news is the total number of LOP’s has only declined by about 10% (from 4,974 to 4,412). 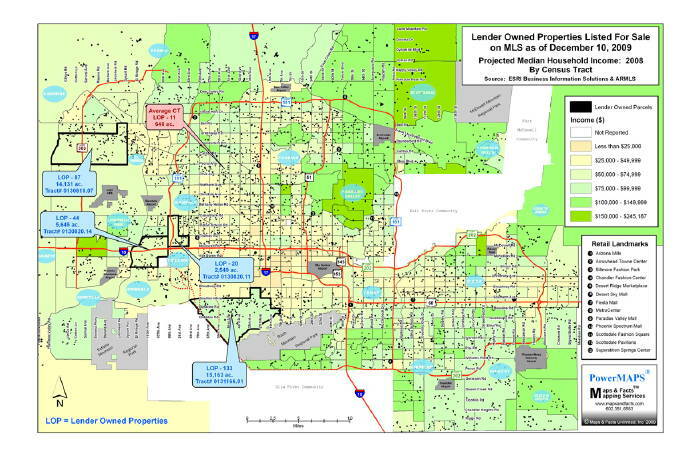 Our 12/08 map follows on page 2 of the PDF download below, or can be viewed here: Lender Owned Properties Listed For Sale (2008).